Natacha Porter had built an impressive career in veterinary science in Cuba. Her various postgraduate qualifications had helped her forge a strong working history in the Cuban Ministry of Agriculture, becoming a national inspector of animal feed practices. She was also a prolific author and experimental scientist and on moving to the UK was looking forward to continuing her career. However, on arriving here her heart sank to find her qualifications weren't recognised. It was clear that to practice veterinary science again she'd need to go back to a very basic level and spend another six or seven years studying. Unwilling to take such a large step backwards, Natacha turned to the internet to look for qualifications that could build on her existing knowledge and areas of expertise. There she found our MSc Food Safety & Control and immediately knew it was the right next step for her: "Not only did I find the modules very interesting, but the course aligned very well with the work I had done in Cuba." Natachas's next step was to go along to an open day at LSBU. She was impressed by what she saw and inspired by the course director, Dr Delia Ojinnaka. Her initial positive reaction was further reinforced by her friends, who knew of LSBU and some of them had studied here. Natacha felt it was a big decision to return to study. Unable to practice as a vet, she'd been working as a housekeeper at a hospital and due to her existing financial commitments to family back in Cuba was relying on her husband to pay many of the household bills. It looked as though the only way she was going to be able to fund her studies was to remortgage their home – a decision that she sums up as "a difficult one – but we didn't want to miss this opportunity." As part of her application process, Natacha had also applied for a Frank Brake Scholarship. Established by LSBU alumnus and entrepreneur Frank Brake, the scholarship is available to students on our MSc Enterprise and MSs Food Safety & Control degrees. Worth up to £4,000, Natacha hadn't seriously thought that she would be successful and so was delighted to find out she had. 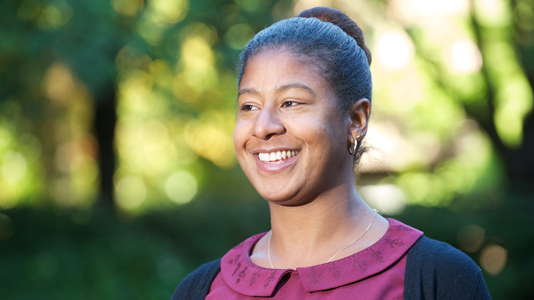 "I was working when I found out I had won my scholarship" explains Natacha. "Afterwards, I was absolutely speechless for the rest of the day! I simply couldn't believe that I had been selected for this amazing opportunity. After trying so many ways to restart my career, I finally have a positive way forward. I am so glad that I decided to come to LSBU," she continues. Read more about postgraduate scholarships. Looking ahead, Natacha is excited by her future again and feels that her scholarship has enabled her to concentrate fully on her degree. "To be able to complete the course without adding to our household debts is a big relief to me, and it allows me to study without such worries. I'm looking forward to graduating, and want to work in a laboratory where I can analyse the composition of foods, or in an animal feed production facility, since my experience is in animal nutrition."